During my first eight years of teaching, I often told people in confidence that one of my biggest teacher fears was “being found out” as a poser, as someone who stood in front of the class or his teacher peers and pretended to know his content and all the best practices of the craft, but who really had little idea and was just making it up as he went along. Indeed, in my first few years of teaching high school biology, chemistry, and physical science, I was essentially teaching my students everything I knew about each subject. Of course, like any teacher, I had learned some of what I taught while in high school myself and most of it in my college courses. But in those early years I often had to relearn much of my knowledge on a topic the night before (or sometimes minutes before!) teaching the material, and many times I just “winged it.” As a result of this insecurity and these moments, I taught with my door closed and my head down, terrified that, at any moment, an administrator or a fellow teacher, or even a parent (! ), might walk in the room and discover me—out me as a poser. On the other hand, students seemed less of a threat because I was assumed to be the authority in the room, and better yet, I was the Grade Giver. “So, you became a teacher because you couldn’t get into med school?” was the next question asked not-so-innocently by another student. “No,” I answered. “I didn’t want to go to med school, and I enjoy teaching.” But the damage was done. To her, and many others of my students at that moment, I became a teacher because I had failed at something else. In those first eight years of teaching, I had several more experiences that devastated my confidence and convinced me that I was pretending to be something I wasn’t, but many of them were of my own doing. On one day during my first year, for example, I had prepared poorly to teach the process of meiosis to my three sections of 10th grade biology students. As I walked the students through the process, trying to draw on my memory of college biology years earlier, I magically—but logically in my mind—modeled the chromosomes going from diploid to triploid (don’t ask, even now I have no idea how I got to triploid) to tetraploid and back to diploid in the gametes. Without considering fertilization and recombination, I was satisfied and my students took careful notes while nodding their heads with understanding. At the end of the day, I began feeling that something was off. I walked next door to confirm with a colleague about the triploid and tetraploid states. He quickly diagrammed meiosis for me on the board and I was crushed—I hadn’t even remembered haploid! “I guess you’ll be teaching this again tomorrow,” he said. I left school that afternoon depressed. I did what I’ve always done in these moments of frustration or embarrassment: I went for an unscheduled and unanticipated extra-long, extra-punishing run. Later that evening, I cracked open a beer and my 4th edition of Campbell Biology from college. The next day I had no choice but to admit to my students that I had gotten it wrong the day before. I had them all ceremoniously tear their incorrect notes out of their binders and we started from scratch. While the experience only added to my insecurity and feeling like a poser, correcting it in front of my students wasn’t as bad as I had imagined. It was okay to admit my mistake, and if I had lost some credibility for some of my students, I had hopefully gained it in others. By the end of seven years I was feeling better about my teaching abilities. I had completed a master’s degree in Science Education at the University of Washington (Seattle), but as a result, I was hungry for more content knowledge. I was also becoming increasingly aware of myriad environmental issues brought on by human activity. This awareness was as a result of teaching biology, but also from reading books like Where the Bluebird Sings to the Lemonade Springs, by Wallace Stegner, and taking a course during my masters called Bird Biology and Conservation. I was curious to see what it would be like to pursue a doctorate in ecology, build a more professional understanding of environmental issues, and purvey that knowledge to others. As I entered my Ph.D. program at the University of Illinois in Urbana-Champaign, I was somewhat overconfident. How difficult could it possibly be? My father had a Ph.D. in theatre and my brother completed his doctorate in chemistry. In my mind, it was just more school, more science, and more writing, and I had taught school, and science, and writing for eight years. I was in for a shock, and I quickly sunk into my poser persona once again. There were the parties where other grad students confidently verbalized their research questions—I didn’t know which questions were worth asking. There were the seminars where I couldn’t make it past the abstract of a scientific paper—who are these people and why are they using such big words? And there were the courses where I learned from both other grad students (teaching assistants younger than me) and professors that I was pretty bad at technical writing. Things really unraveled when I failed my preliminary exam in front of my committee members at the beginning of my third year and my research proposal was deemed inadequate. Fortunately, the committee agreed to give me a second chance, and I had six months to show that I had what it took to be a doctoral candidate. But another punishing run was in order to clear my head. Over those next six months, I dug into the literature on the timing of bird migration, climate change, and food webs. But I also discovered, through my reading, 100 years of historical bird migration data for east central Illinois that had never been analyzed, let alone through the lens of climate change. By the end of my six-month extension, I had learned my complex system, rewritten my research proposal, and gotten a manuscript accepted for publication. Needless to say, my second shot at the prelim was a different story than the first. However, this accomplishment was not without pain and more posing. Indeed, there was a poignant moment where I nearly (and literally) walked out of the woods and quit. It was a chance conversation in the woods with one of my committee members that nearly ended my pursuit of my doctorate for good. I had yet to finish and defend my second shot at the research proposal when my committee member asked me, “What are the hypotheses you are testing with this project?” I explained that if we had an average spring warm up, then the timing of the leaves, caterpillars, and birds would be synchronized, but in early or late springs, there would be a mismatch in one or more of the trophic levels. “No,” she said, “Those are predictions.” I was confused. I had given her an “educated guess,” an “If…, then…” statement exactly in the form I had learned in my science classes and identical to how, for eight years, I had taught my high school students to write hypotheses. I tried again, and failed. “You don’t know what a hypothesis is, do you?” she said. She was right. In quiet embarrassment and intense frustration, I realized that I had taught a severely limited and arguably incorrect version of the process of science to the 1,000+ students that had passed through my high school courses. Was I indeed nothing more than a poser, a pretend teacher and scientist? Time for a long run. I am now in my 11th year as a teacher-post-graduate school, and while I thought my experiences as a poser were unique and without parallel, it was recently revealed to me by a colleague during a teacher inservice that what I had experienced as a young teacher, and then again as a graduate student, was not unique and isolated at all—and it had a name: The Impostor Syndrome or Impostor Phenomenon. As described by Manfred F. R. Kets de Vries in a 1990 paper titled The Impostor Syndrome: Developmental and Societal Issues (unfortunately, this one is behind a pay wall for most people) the impostor syndrome was first formally described in a 1925 clinical paper by Carl Abraham. Abraham described impostorism from a military perspective as a “person’s ability to gain the trust of others and to betray such confidence immediately through deception.” Hmm, a teacher does in fact gain the trust and confidence of his or her students. The betrayal (in the imagination of the impostor teacher) comes through deceiving the students, faculty, administration, and parents into thinking that he or she is an expert at the content and the craft of teaching. I was an impostor teacher. There it is, a perfect definition of me as a teacher and graduate student: internal experience of intellectual phoniness. Yes, still. My lowest (1-not at all true) and highest (5-very true) responses were revealing of where I am now, 23 ½ years into teaching. I answered not at all true to the statement, “I avoid evaluations if possible and have a dread of others evaluating me.” I would have easily given myself a 5 early in my career. But now I welcome input and criticism from not only colleagues and administrators, but also my students, and I am constantly working on improving my craft of teaching through teaming with other teachers, attending professional development, presenting at meetings, and writing. So what has changed? Is it experience, age, confidence? I don’t know. I do know that some things haven’t changed. For example, I did answer very true to the statement, “I’m afraid people important to me may find out that I’m not as capable as they think I am.” This has always been the case for me. I never want to disappoint my parents, my siblings, my wife, my daughter, or my friends. Yet, this trait is especially exemplified professionally, and is it possible that striving to please those important to us as teachers (students, colleagues, administrators) may actually be necessary to our motivation to perform at the highest possible level? Or should this motivation come strictly from within? Either way, I’m still an impostor and regardless of my growth in confidence about myself, I don’t think I’ll ever be able to justify a score any lower than 5 for the “people important to me” category, and it may be impossible for me to ever score lower than 50 on the questionnaire as a whole—at least as long as I stay in teaching. In The Impostor Phenomenon, Sakulku and Alexander provide a never-ending flowchart that illustrates the impostor cycle that so many of us cannot escape. 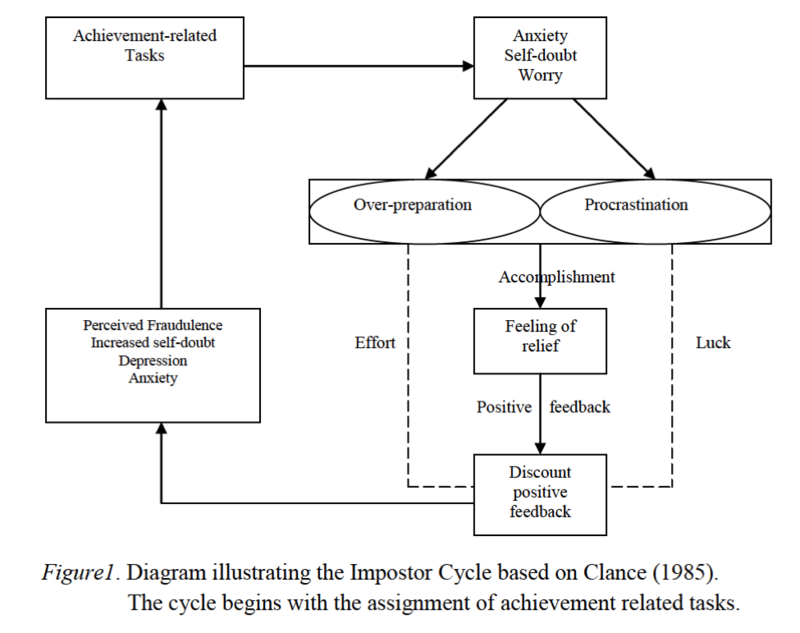 So, what is it about teaching that allows us to fall into the vat of the impostor syndrome and enter a cycle we cannot escape? It turns out that it may not be about teaching at all. People in nearly every profession, including medicine, academics, science, administration, and politics can suffer from impostorism. Parents and even students can feel like impostors. Whenever a person finds him or herself in a situation where he or she is expected to be highly skilled yet is under any combination of public scrutiny, supervisor evaluation, peer assessment, or self criticism he or she can experience the feelings characteristic of impostorism. Even romantic relationships can bring on the impostor syndrome. Perhaps everyone is in the impostor cycle in some way or another. I know I certainly am, because I am a teacher, an impostor still and always, in many ways, and never alone. And I still need those long runs. Next Can acupuncture help cure students of pseudoscience? This is the first time I have seen your website! I know that I felt this way while I was teaching. Thank you for letting me know I wasn’t not alone! If only we could make how to manage impostorism part of teacher training. Thank you for sharing. I am in my 8th year of teaching middle school science. I needed to hear this. Paul, your experience is so similar to mine, early clinical lab career, late (30’s) doctorate in molecular genetics. Now after secondary bio teaching for 21 yrs. still acutely aware of what I don’t know and sheepish that I ‘ll be found an imposter and send me back to a previous life. I finally am able to admit (a little) to my kids ” I don’t know, but that’s a great idea/question, let’s find out more background about _____ and ask more questions.” Technology in the classroom is a great equalizer between teacher and student. We can move forward as curious explorers together. I love it, Pam! Yes, I embrace my students’ technology in the classroom. We can help them learn how to manage it for everyone’s benefit. wow. This is the story of my life. I finish my last year of residency for medical training, five months to go, and I feel like I have no idea what I’m doing the majority of the time. I totally follow the idiom “fake it till you make it.” It helps that some of my co-residents have just started and I can compare myself to them and note that I really have learned and developed so much. Nonetheless, every day is a humbling experience in which I determine that I truly will never know what I am doing. Thanks for this post. I love it! Thanks for the feedback, Annemarie! Let me know how I can help. I’ve read your beautiful essay several times and keep coming back to it because of how effectively it reveals a key aspect of this idea that you don’t say explicitly. The imposter who knows it, embraces it and speaks openly and honestly about it has probably mostly conquered the beast. The one who responds out of fear with overconfident swagger is the true fraud. Take two teachers (or physicians, politicians, ministers, etc.) with comparable advanced knowledge in their fields. Saddle one with the “internal experience of intellectual phoniness” and the courage to speak openly about it. Give the other person the same level of self doubt but make fear that person’s motivator. You are clearly the first individual and you’ve built deep trust and credibility with your students and colleagues. For me, the second person was that middle school science teacher who ridiculed students who asked questions and likely turned hundreds of students off to science over his career. I hope more teachers read your blog and embrace their inner imposter! First, the author’s post above was too long. Second, I am a teacher and I do not feel like a poseur. I feel very much at home as a teacher, and I feel intellectually confident in the classroom. The only times I ever felt a little uneasy in my academic career were when I was at an Ivy League college for my BA, and I knew many students were smarter than myself, and a later MA degree at a top university, where I felt a few of the students were further immersed in the disciplinary norms than myself, but in another MA and my PhD programs, I felt like I was one of the smartest students. Regardless, I didn’t see myself as a poseur, but I always knew I belonged in all of these programs.